Care for a side of art with your bottle of Dom? Join Bagatelle Miami for its final night of “Artist in Residence” powered by Marcel Katz a.k.a The Art Plug and watch a live art installation by emerging local artist Tiago Magro as he transforms Bagatelle’s most popular menu item (Dom Perignon) into 10 rare works of art. Immerse in art while enjoying craft cocktails and food so good you’ll think you flew to the south of France. The Tiago-splashed bottles are available for purchase and all proceeds will go towards The Irie Foundation, founded by Miami Heat’s very own DJ Irie. Bagatelle Miami’s hosting its exclusive “Artist in Residence” night in collaboration with notorious Miami art dealer Marcel Katz a.k.a The Art Plug and local Miami artist, Tiago Magro. Enjoy a side of art with your Dom as Bagatelle displays the first set of limited-edition Dom Perignon bottles designed by Tiago and available for purchase. All proceeds from each purchase will go towards The Irie Foundation, founded by Miami Heat’s very own DJ Irie. Showcase your creativity and step into the fantastical world of Nocturne, a new late-night, performance art-driven dance party at Faena Theater. Kicking off on March 22, this three-month series will transport guests to alternate universes centered around a colorful theme that will inspire the night’s costumes, soundtrack, performances and cocktails. Nocturne will also feature live DJ sets and musical acts by local artists set to heart-pounding beats and striking vocals. Performances will bur the lines between audience and artist with an impressive lineup of burlesque dancers, aerialists, acrobats, musicians and more, all of whom will join together to create a unique experience that’s part cirque nouveau, part dance rave and part Miami Beach nightclub. With participation and creative expression at its core, Nocturne invites partygoers to dress in theme with each event, engage with performers, and share this one-of-a-kind experience with one another. 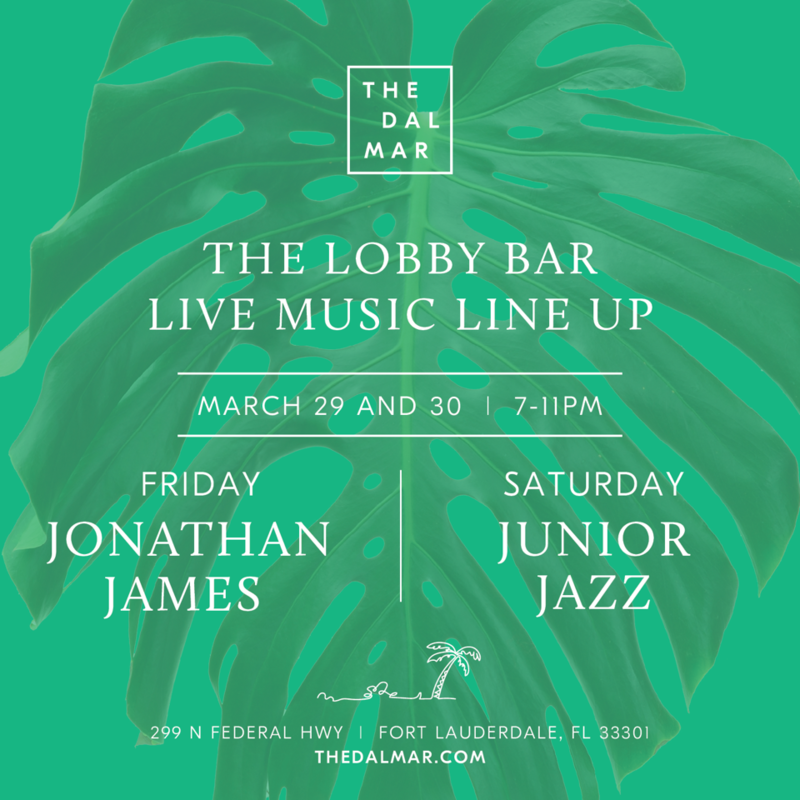 Description: Fort Lauderdale is receiving a refreshing dose of urban style at The Dalmar. As a part of the hotel’s Lobby Live Music Series, the chic design-focused hotel is inviting guests to meet on the hotel’s sixth floor for local live music, sultry vibes and dazzling cocktails – complete with a Moet vending machine. March 16 will feature live tunes Bobby Weidman from 7 – 11 p.m. Lively. Vibrant. Versatile. Welcome to your new weekend. Description: Fort Lauderdale is receiving a refreshing dose of urban style at The Dalmar. As a part of the hotel’s Lobby Live Music Series, the chic design-focused hotel is inviting guests to meet on the hotel’s sixth floor for local live music, sultry vibes and dazzling cocktails – complete with a Moet vending machine. March 15 will feature live tunes Jonathan James from 7 – 11 p.m. Lively. Vibrant. Versatile. Welcome to your new weekend. Description: Fort Lauderdale is receiving a refreshing dose of urban style at The Dalmar. As a part of the hotel’s Lobby Live Music Series, the chic design-focused hotel is inviting guests to meet on the hotel’s sixth floor for local live music, sultry vibes and dazzling cocktails – complete with a Moet vending machine. March 9 will feature live tunes Evan Grushka from 7 – 11 p.m. Lively. Vibrant. Versatile. Welcome to your new weekend. 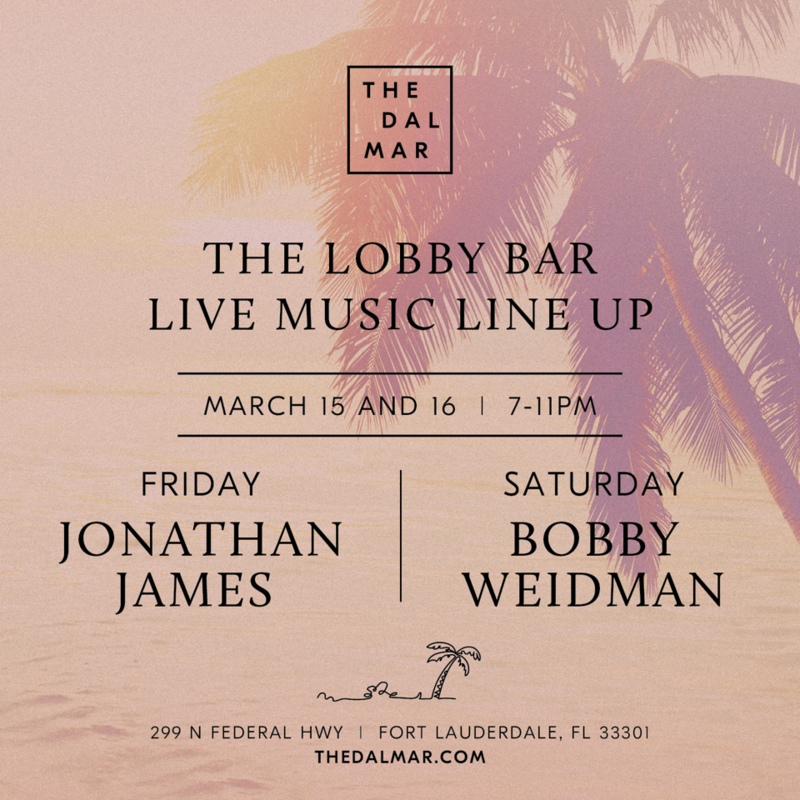 Description: Fort Lauderdale is receiving a refreshing dose of urban style at The Dalmar. As a part of the hotel’s Lobby Live Music Series, the chic design-focused hotel is inviting guests to meet on the hotel’s sixth floor for local live music, sultry vibes and dazzling cocktails – complete with a Moet vending machine. 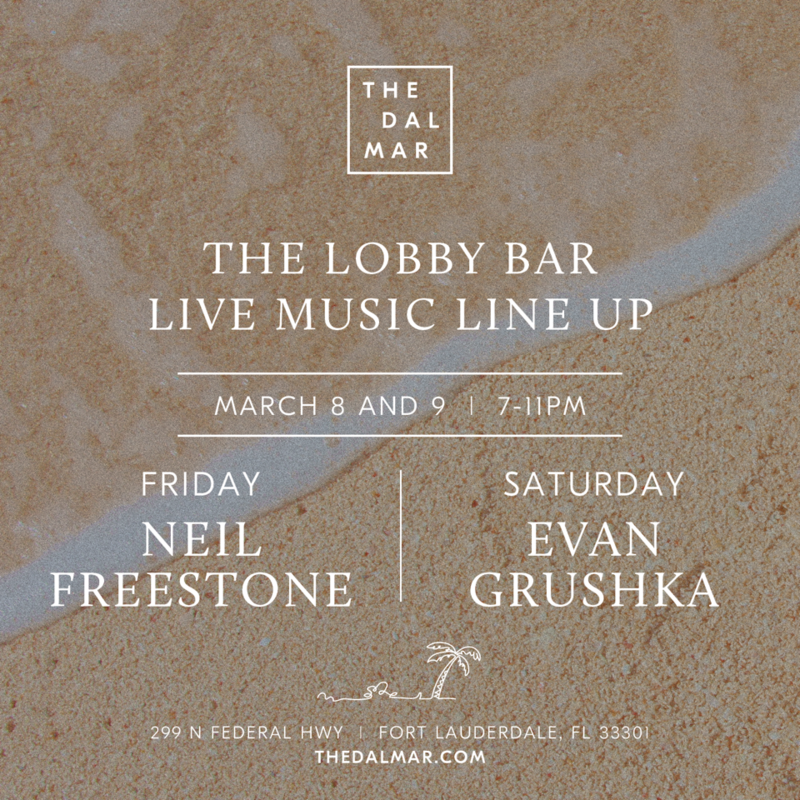 March 8 will feature live tunes Neil Freestone from 7 – 11 p.m. Lively. Vibrant. Versatile. Welcome to your new weekend. Description: Fort Lauderdale is receiving a refreshing dose of urban style at The Dalmar. As a part of the hotel’s Lobby Live Music Series, the chic design-focused hotel is inviting guests to meet on the hotel’s sixth floor for local live music, sultry vibes and dazzling cocktails – complete with a Moet vending machine. March 23 will feature live tunes Stephen Seto from 7 – 11 p.m. Lively. Vibrant. Versatile. Welcome to your new weekend. Description: Fort Lauderdale is receiving a refreshing dose of urban style at The Dalmar. As a part of the hotel’s Lobby Live Music Series, the chic design-focused hotel is inviting guests to meet on the hotel’s sixth floor for local live music, sultry vibes and dazzling cocktails – complete with a Moet vending machine. 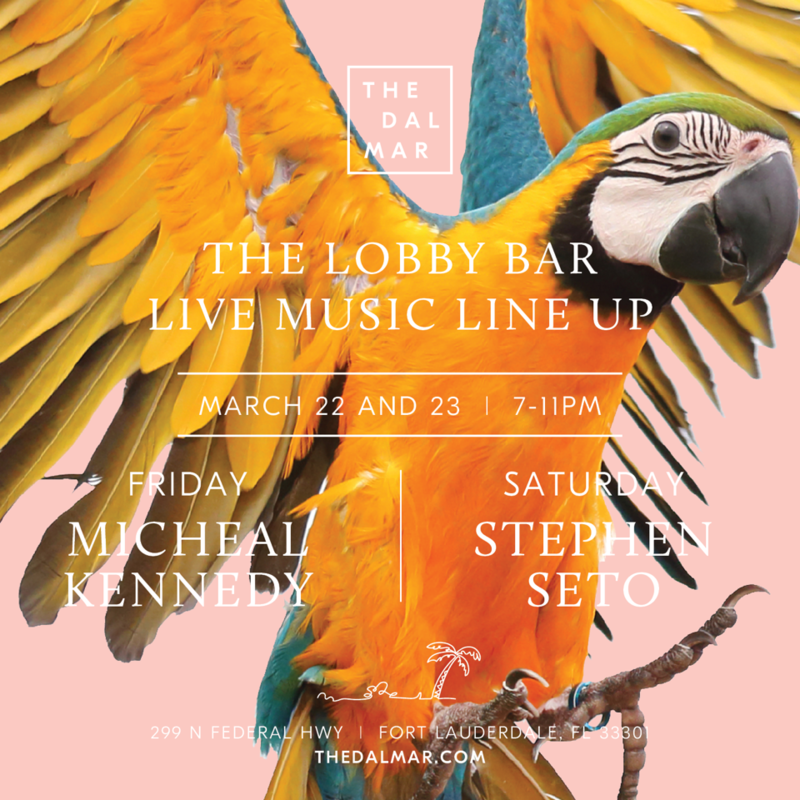 March 22 will feature live tunes Michael Kennedy from 7 – 11 p.m. Lively. Vibrant. Versatile. Welcome to your new weekend. Fort Lauderdale is receiving a refreshing dose of urban style at The Dalmar. As a part of the hotel’s Lobby Live Music Series, the chic design-focused hotel is inviting guests to meet on the hotel’s sixth floor for local live music, sultry vibes and dazzling cocktails – complete with a Moet vending machine. March 30 will feature live tunes by Junior Jazz from 7 – 11 p.m. Lively. Vibrant. Versatile. Welcome to your new weekend. Fort Lauderdale is receiving a refreshing dose of urban style at The Dalmar. As a part of the hotel’s Lobby Live Music Series, the chic design-focused hotel is inviting guests to meet on the hotel’s sixth floor for local live music, sultry vibes and dazzling cocktails – complete with a Moet vending machine. March 29 will feature live tunes by Jonathan James from 7 – 11 p.m. Lively. Vibrant. Versatile. Welcome to your new weekend. Friday: Kick off the weekend at Sophie’s “Friday Feels” vibe featuring sounds by DJ Los De La Vega. The Brazilian-American Chamber of Commerce of Florida (BACCF) & Nisi B Home cordially invite you to a networking event on Thursday, February 21st. Hotel Gaythering is turning 5 years old and throwing their very own MET Gayla Costume Party on February 15th, 2019. The theme is “SAVAGE LOVE”…think Gladiator Warriors, dressed in high fashion. Complete with a custom Red Carpet, Red Carpet Interviews, and a professional photographer – to complete your “lewk” with a high fashion photoshoot for you and the crew. Love is a battlefield, so prepare for war! Retail Sponsors: Adams Nest Queer Clothing and Accessories, Studio Ready – the luxurious boy body scrub brand! The event starts at 9pm. Red Carpet arrivals with Instagram Live red carpet interviews with Anthony Black – host of his own radio talk show focusing on black culture and issues. Additional interviews will be hosted Spanish by Argentinian Instagram Influencer and HEART THROB @brunoalvarezladd .He will be interviewing live from his instagram account and tagging guests! Taking high fashion portraits of the guests will be Art Gaysel Alumni and noted photographer for his Ken Doll Series, Courtney Charles. @mrcourtneycharles. Portraits will be taken in the courtyard and packages are $50 for 2 edited photographs and $75 for 4 edited photographs. Shooting the event for the night is Gaythering Alumni/Art Gaysel Alumni/Gaythering promotional photographer @JeremyLucido . Spinning for the night is local DJ and Gaythering Fave DJ Hottpants known for his work with local festival Wigwood and for his resident spinning at Gramps in Wynwood. Complimentary Perrier Jouet Champaign from 9pm-10pm. Established in 2006 by Ian Burrell the U.K RumFest has been a pioneer in elevating the popularity, awareness, and quality of rum in England. Created in 2007 by Federico Hernandez, the US RumLab promotes rum as a lifestyle and educates consumers and spirit industry members. Now the organizations are collaborating to present the first Miami Rum Congress. Two-day event focused on rum education and premiumization. Catering to consumers and industry tradespeople, the Miami Rum Congress will feature a selection of premium rum brands from all around the world. Members of the beverage trade will have intimate, exclusive access to brand representatives, spirit tastings, seminars and educational breakout sessions.